We might be one step closer to the vision of Internet-connected wireless implanted devices. University of Washington engineers have introduced a new way of communicating that allows devices such as brain implants, contact lenses, credit cards and smaller wearable electronics to talk to everyday devices such as smartphones and watches. This new "interscatter communication" works by converting Bluetooth signals into Wi-Fi transmissions over the air. Using only reflections, an interscatter device such as a smart contact lens converts Bluetooth signals from a smartwatch, for example, into Wi-Fi transmissions that can be picked up by a smartphone. The new technique is described in a paper to be presented Aug. 22 at the annual conference of the Association for Computing Machinery's Special Interest Group on Data Communication (SIGCOMM 2016) in Brazil. 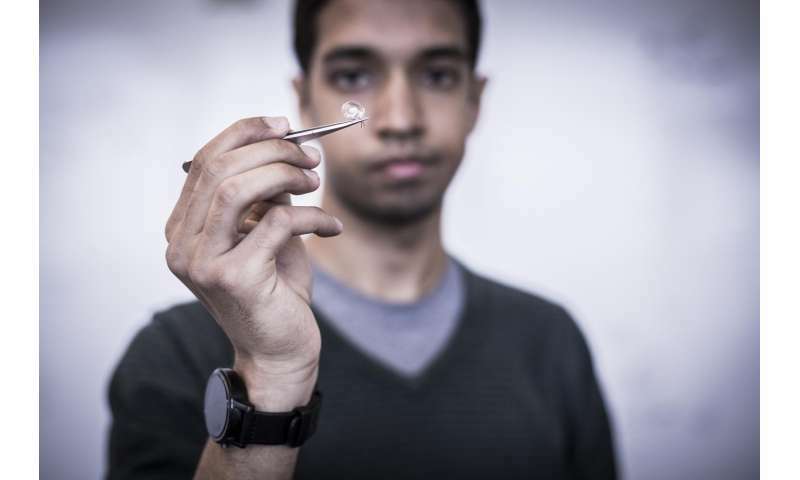 "Wireless connectivity for implanted devices can transform how we manage chronic diseases," said co-author Vikram Iyer, a UW electrical engineering doctoral student. "For example, a contact lens could monitor a diabetics blood sugar level in tears and send notifications to the phone when the blood sugar level goes down." 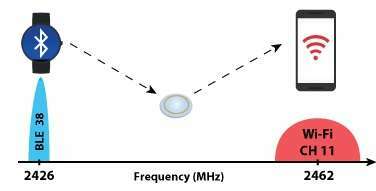 Due to their size and location within the body, these smart contact lenses are too constrained by power demands to send data using conventional wireless transmissions. That means they so far have not been able to send data using Wi-Fi to smartphones and other mobile devices. Those same requirements also limit emerging technologies such as brain implants that treat Parkinson's disease, stimulate organs and may one day even reanimate limbs. The team of UW electrical engineers and computer scientists has demonstrated for the first time that these types of power-limited devices can "talk" to others using standard Wi-Fi communication. Their system requires no specialized equipment, relying solely on mobile devices commonly found with users to generate Wi-Fi signals using 10,000 times less energy than conventional methods. "Instead of generating Wi-Fi signals on your own, our technology creates Wi-Fi by using Bluetooth transmissions from nearby mobile devices such as smartwatches," said co-author Vamsi Talla, a recent UW doctoral graduate in electrical engineering who is now a research associate in the Department of Computer Science & Engineering. The team's process relies on a communication technique called backscatter, which allows devices to exchange information simply by reflecting existing signals. Because the new technique enables inter-technology communication by using Bluetooth signals to create Wi-Fi transmissions, the team calls it "interscattering." Interscatter communication uses the Bluetooth, Wi-Fi or ZigBee radios embedded in common mobile devices like smartphones, watches, laptops, tablets and headsets, to serve as both sources and receivers for these reflected signals. In one example the team demonstrated, a smartwatch transmits a Bluetooth signal to a smart contact lens outfitted with an antenna. To create a blank slate on which new information can be written, the UW team developed an innovative way to transform the Bluetooth transmission into a "single tone" signal that can be further manipulated and transformed. 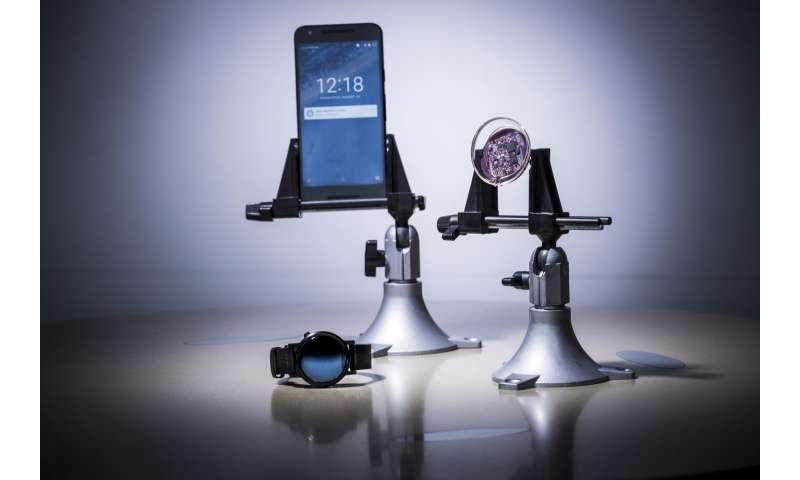 By backscattering that single tone signal, the contact lens can encode data—such as health information it may be collecting—into a standard Wi-Fi packet that can then be read by a smartphone, tablet or laptop. "Bluetooth devices randomize data transmissions using a process called scrambling," said lead faculty Shyam Gollakota, assistant professor of computer science and engineering. "We figured out a way to reverse engineer this scrambling process to send out a single tone signal from Bluetooth-enabled devices such as smartphones and watches using a software app." The challenge, however, is that the backscattering process creates an unwanted mirror image copy of the signal, which consumes more bandwidth as well as interferes with networks on the mirror copy Wi-Fi channel. But the UW team developed a technique called "single sideband backscatter" to eliminate the unintended byproduct. "That means that we can use just as much bandwidth as a Wi-Fi network and you can still have other Wi-Fi networks operate without interference," said co-author and electrical engineering doctoral student Bryce Kellogg. The researchers—who work in the UW's Networks and Mobile Systems Lab and Sensor Systems Lab—built three proof-of-concept demonstrations for previously infeasible applications, including a smart contact lens and an implantable neural recording device that can communicate directly with smartphones and watches. "Preserving battery life is very important in implanted medical devices, since replacing the battery in a pacemaker or brain stimulator requires surgery and puts patients at potential risk from those complications," said co-author Joshua Smith, associate professor of electrical engineering and of computer science and engineering. "Interscatter can enable Wi-Fi for these implanted devices while consuming only tens of microwatts of power." Beyond implanted devices, the researchers have also shown that their technology can apply to other applications such as smart credit cards. The team built credit card prototypes that can communicate directly with each other by reflecting Bluetooth signals coming from a smartphone. This opens up possibilities for smart credit cards that can communicate directly with other cards and enable applications where users can split the bill by just tapping their credit cards together. "Providing the ability for these everyday objects like credit cards—in addition to implanted devices—to communicate with mobile devices can unleash the power of ubiquitous connectivity," Gollakota said. Heh. Reverse engineering the spreading sequency of bluetooth so that you can reflect full wifi is foolish. So an updated or a modified Bluetooth protocol would then break all of these other devices too? It might be good for throw-away sensors, but not much else.